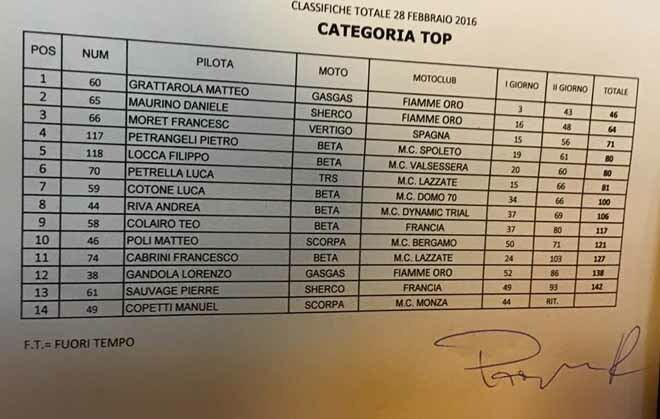 The 34th edition of the famous International classic that opens the season was won for the third consecutive year by Matteo Grattarola (Gas Gas). This competition was a kind of feather in the cap of Giulio Mauri, one of the most famous character in Trial world who gave so much to this sport. From the year of his passing away, this event is also celebrated as Giulio Mauri Trophy. Grattarola started strongly on Saturday loosing just 3 points on the 20 sections, quite slippery for the light rain. On Sunday the rain dropped with more intensity and all the scores worsened a lot. Grattarola was still the best, scoring 43 points on the 30 sections.